It is a Traditional recipe to south Idians.It tastesgood.No artificial flavours are added inthis. Everyone likes this. Cook rice in a pan. When it is half cooked add milk, jagerry, sugar and cook for 5min. Fry cashews, kissmiss in ghee and keep aside. Take another pan pour ghee into this and add the cooked rice in the pan for 3 min until all the ghee well mixed with the rice. hi... i think coconut pieces and moong dal must be added to ur ppongal ...! 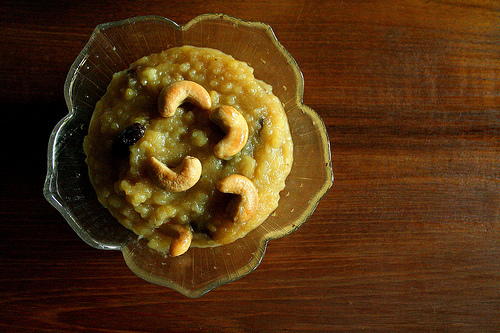 hi madhavi, i've recently been member in this site.this recipe without coconut is called Paramannam.Actual Chakra Pongal is done by adding fried green gram dal,coconut pieces,cashewnuts,raisins and cardamom powder into half boiled sweet rice and cooking all these together till done.This is usually given as Prasadam in Andhra temples. Thanks to Khana Khazana publishing my Recipe i think everyone like this recipe "CHAKRA PONGALI "